After several unsuccessful attempts, I finally managed to secure a reservation at Dean Street Townhouse! You couldn’t imagine my excitement. This restaurant has set the blogosphere alight, and I’ve been pretty keen to try it ever since it opened late last year. For those familiar with the Soho House Group (Houses include Soho House, Shoreditch House; restaurants include Cecconi’s, Cafe Boheme, Electric Brasserie), it’s pretty easy to picture how stylish it is. 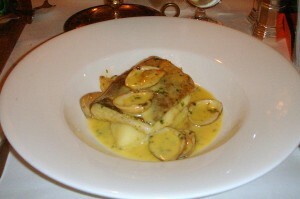 The restaurant is housed in an unmissable beautiful cream coloured Georgian building that seems to light up Dean Street. The interior doesn’t disappoint either, with its plush booth seating, red leather backed chairs, vintage chandeliers and a massive American-style bar that runs the length of the room. This place spells glam, and it’s been known to draw in the rich and famous! The food is billed as British, and for starters I chose the scallops in the half shell (£10.50) which were juicy and succulent. They were covered with some finely chopped wild boar and ramson (wild garlic) that gave them a crispy finish. 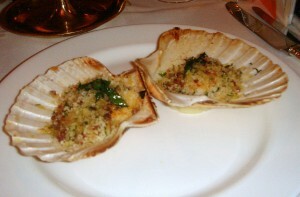 Lots of butter rounded off the ensemble, leaving the scallops exploding with rich, decadent, buttery overtones. However the presentation – two shells plonked on the plate with no additional garnishing – seemed dull. 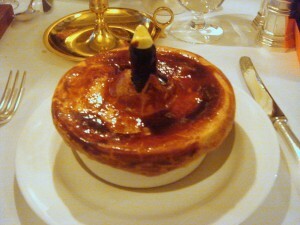 Chicken, leek and wild mushroom pie (£14.50) was nicely done. The filling gave way to a lovely creamy sauce and tender bite-sized pieces of chicken. The puff pastry topping was light and flaky, although the version I tried on the rabbit pie at Quo Vadis recently showed more finesse. 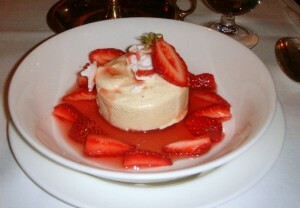 Nevertheless, this was a very enjoyable dish. A generously sized piece of cod (£16.75) was lovely and moist, but it was slightly under seasoned. Also, it would have worked better with a crispier skin. A creamy sauce with surf clams and chervil finished off the dish nicely, but the sauce was a touch too heavy against the delicacy of the fish. Some dreamy mash potatoes served as an accompaniment. For desserts, we chose the ice cream selection (chocolate, vanilla and pistachio) (£4.25) and an iced vanilla parfait with some wonderfully sweet Gariguette strawberries (£5.50). The ice cream was lovely, and the acidity in the strawberries helped to cut the richness of the parfait which had a lovely vanilla flavour. The Soho House Group is a well-oiled hospitality machine, and as expected, the service was timely, if occasionally a bit perfunctory. Nevertheless the food was very enjoyable, and combined with the gorgeous décor and seductive, buzzy atmosphere, Dean Street Townhouse is really hard to pass up as the kind of place you want to show off to your friends. Price range: Three courses ranges from £25 to £43. Excludes drinks and service. Lovely to finally meet you at the Waitrose party. I still haven’t been able to get into Dean Street Town house (my last minute booking tactics are clearly failing me) – so you have beaten me! Hi Gourmet, yes it was lovely meeting you too! I know, its nearly impossible to get a reservation at Dean Street! Crazy!